A boozed-up patient who lashed out at a hospital security guard during treatment has been jailed for 24 weeks. 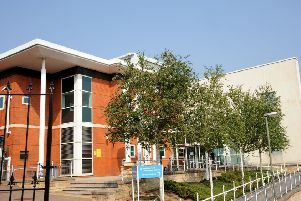 Chesterfield magistrates’ court heard on May 23 how Richard Musgrove, 38, of West Street, Eckington, was being treated for a suspected head injury at Chesterfield Royal Hospital when he kicked out and caught the guard and spat at him. Becky Allsop, prosecuting, said Musgrove had been trying to leave and had been asked to come back before he lashed out and caught the guard’s arm and he spat in the guard’s eye and mouth. The guard has had to undergo tests to see if he may have contracted any disease, according to Mrs Allsop. Musgrove told police he had been drinking and could not recall the assault on May 22. Mrs Allsop added Musgrove was previously caught breaching a Chesterfield town centre on May 20. He pleaded guilty to breaching the Criminal Behaviour Order and admitted assault. Kevin Tomlinson, defending, said Musgrove is ashamed of his behaviour.